As I posted last week, we are blessed with gobs of pumpkins! We love pumpkin soup, pumpkin muffins, pumpkin pie … there is almost no end to what you can do with pumpkin – but, what do you do with all the pumpkin seeds? We toast them! 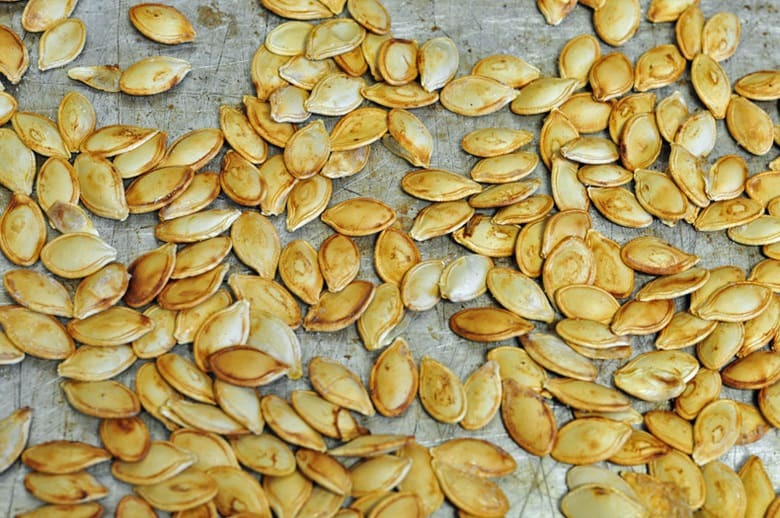 Pumpkin seeds have a wonderful flavor especially when tossed with butter and sea salt. My family loves them and I bet yours will too! As with any seed, nut or grain, proper preparationis very important – precautions should be taken to break down the phytic acid. In nature, the phytic acid helps protect the seed until germination occurs thus insuring (as much as possible) the re-population of the plant. In the human body, however, phytic acid works as an anti-nutrient and actually binds with minerals in the foods eaten and those in our bodies to prevent absorption of nutrients. So, it is important to neutralize the phytic acid. This can be done by soaking, sprouting and fermenting. 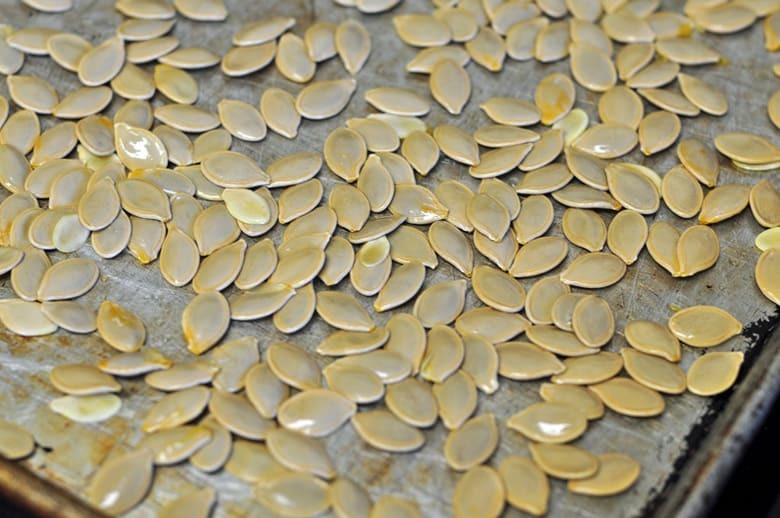 For pumpkin seeds, I have found soaking to be the best and easiest method. After you have scooped out the seeds from the pumpkin, separate the seeds from the stringy pulp. Place the seeds in a bowl and cover with water. Allow to soak for 24 hours. 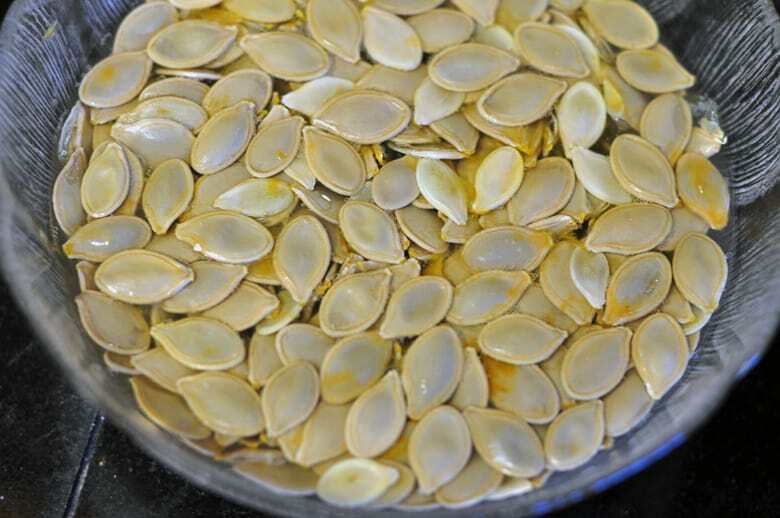 Drain the pumpkin seeds and spread in a single layer on a buttered baking sheet. Sprinkle with salt (from my affiliate – where to buy REAL salt) as desired – you can always add more after the pumpkin seeds are toasted. Bake at 350F for 20 minutes until golden brown. Be sure to stir the seeds every 10 – 15 minutes to prevent sticking and burning.